A tarp tent is a wonderful addition to your bug out bag as it can be used in many different ways. A tarp tent is a tarpaulin, a plastic or nylon sheet, used in place of a tent. It is usually rigged with poles, tent pegs, and guy lines. 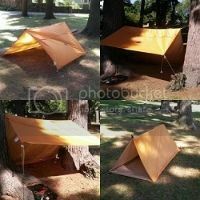 Ultralight backpackers use tarp tents because they are easy to set up and lightweight compared to other backpacking shelters which makes for a more pleasant hike. Especially if you need a quick shelter when hit with a sudden downpour. Recently I was looking for a good, reliable tarp/tent for my husband. We wanted something light, durable, and affordable. We decided, at the recommendation of others, on the UST Base Tube Tarp/tent 1.0. (Ultimate Survival Technologies) We have never been happier with a purchase. We did a lot of shopping around and found the UST Tube Tarp to be one of the most affordable, reliable and used ones out there. Before this was shown to me the only recommended tarps I found were $80 or more. That can really hit your pocket if you have 4 bug out bags to supply for. that was a nice change from expensive basic gear. Below are some wonderful review videos for you to check out and decide for yourself if this will be an addition to your bug out or camping gear. A list of products in the videos will be posted at the end of the article.